Home | Your Needs | About Us | Services | Pricing | Mixing & Programming | Are All DJs the Same? As stated on my home page, we are an upscale non-obtrusive DJ Company that will present nothing less than the very best for your special day. We do not take a cookie cutter approach to each and every reception we are involved in due to the fact that every bride and groom, venue and guests are different and unique. Whether you desire an elegant and classy reception or prefer guests bouncing off the walls and hanging on the chandeliers, we are the DJ Company that can provide this. Not everyone possesses the required skills to be a top drawer DJ. Having an iPod or laptop loaded with lots of songs and the ability to rent a sound system does not make someone a DJ. If it were that simple then you could find a high school kid with an iPod/Laptop, rent a sound system and do it yourself. Instead, you need a professional DJ with not only mixing and programming skills, but also MC abilities. I will discuss mixing skills and programming skills on a separate page. We associate ourselves with clientele who have high expectations of their wedding day. After all, anyone can be “average.” However, if you have high expectations of your wedding reception, then I encourage you to contact me. We offer a polished and well executed performance. 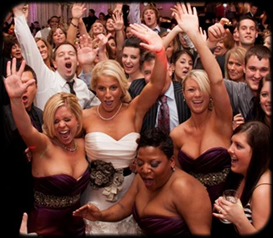 You are not planning an average wedding reception, so why hire an average DJ Company?